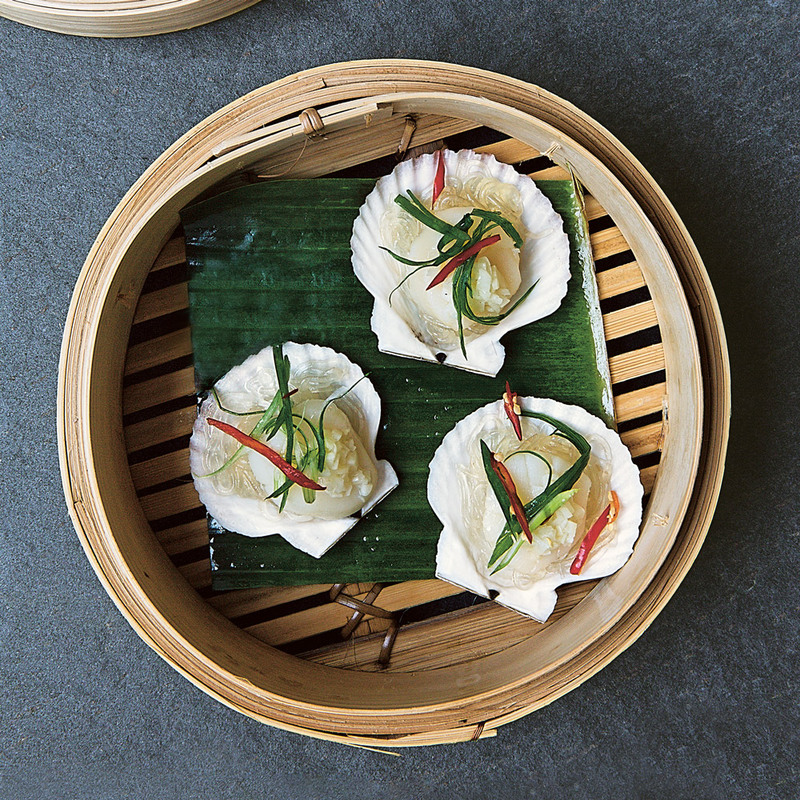 These garlicky steamed scallops come together in less than 30 minutes, making for a quick and easy appetizer. This recipe originally appeared in CHINA: THE COOKBOOK by Kei Lum and Diora Fong Chan. Clean the scallop shells with a brush and pat dry with paper towels. Separate the 2 sides of the shells and discard the side unattached to the adductor muscles. Remove the muscles from the shell and discard the intestines, then rinse under cold running water. Set the scallops aside in a bowl and reserve 8 shells. Soak the vermicelli in a bowl of hot water for about 3 minutes to soften. Drain, then cut the vermicelli into 2-inch/5-cm lengths. Divide the vermicelli among the shells and place the scallops on top. Heat 3 tablespoons oil in a wok or large skillet (frying pan), add half the chopped garlic and stir-fry over low heat for 1 minute until lightly golden and crisp. Use a slotted spoon to remove the garlic, and drain on paper towels. Set aside. Combine the remaining chopped garlic, the salt, and remaining 1 tablespoon oil in a bowl and mix well. Drizzle over the scallops. Transfer to a collapsible pot or bamboo steamer over a pot of boiling water. Steam, covered, for 5–6 minutes until the scallops are cooked through. Top with the garlic, scallions (spring onions), and chile, if using.